Vigorous evergreen or semi-evergreen climber native to Japan, Korea and China. Compound, bright green leaves with five elliptic to obovate leaflets to 5 cm long, notched at the tips. Fragrant, cup-shaped, purplish-red flowers in pendulous racemes during spring. Flowers may be followed by sausage-shaped fruits to 10 cm long. Prefers a partially shaded position in any reasonable soil. Tolerates full shade and full sun. Avoid very dry and waterlogged soils. Resents root disturbance, so best planted when young, and not to be transplanted when mature. Requires support to climb. In suitable growing conditions Akebia is a vigorous grower and needs regular trimming. Copes with hard pruning. Akebia quinata is frost hardy, but in cold climates it behaves as a semi-evergreen or even deciduous climber with the extent of leaf loss depending on the degree of winter cold. In New Zealand Akebia quinata is listed in the National Pest Plant Accord and is prohibited from commercial propagation, sale and distribution across the country. Ideal as a fast cover for pergolas, fences and gazebos. If you wish to add a slimline vertical element to a garden bed, then let Akebia grow up against a tall post and trim it a few times per year. Help the shoots find support by attaching netting to the outside of the post. Could also be used as an informal ground cover. Vigorous evergreen climber with wiry stems, native to Australia. Occurs naturally in a variety of habitats, including coastal areas and mountains. Simple, oval to lance-shaped, mid to dark green, leathery leaves to 12 cm long, with prominent veins. Violet purple pea-like flowers, 1 cm across, smother the pant in pendent racemes during mid to late winter and early spring. Hardy to -70C, but some damage may occur at lighter frosts. Flowers best in full sun and well-draining neutral or acidic soil, but tolerates a wide range of growing conditions. Has a low water requirement once established. Prune hard after flowering to keep compact, encourage new growth, and to prevent the plant from becoming leggy at the base. Ideal climber for flower display from mid winter. May also be grown as a ground cover, spilling over banks. Suitable as an indoor plant in bright light. Very vigorous evergreen climber native to China. Pinnately compound, dark green leaves with 5 to 7 leaflets. Masses of reddish pink flowerbuds open during late winter and early spring (and intermittently during the rest of the year) to fragrant white, starry flowers, 2 cm across and 4 cm long, sometimes followed by small glossy black berries. Spreads quickly by producing long runners and forming roots where nodes are in contact with soil. Runners can even grow under buidlings since the plant is tolerant to full shade and drought. Is naturalised in Australia and New Zealand, and is regarded as an invasive species in several regions of these countries. Forms a dense ground cover, preventing the establishment of native seedlings and smothering other vegetation. Very easy to grow and propagate. Tolerant to a range of extreme conditions including sun, shade, drought, dampness, salt, and wind. Prune to keep compact and remove runners to prevent the plant from spreading elsewhere. If you wish to grow Jasminum polyanthemum in New Zealand or Australia check with the local authorities to make sure it is not banned in your area. Grown for its strongly perfumed flowers and vigorous climbing habit. Suitable as an indoor plant. Evergreen climber, endemic to New Zealand, but only occasionally found in its natural habitat of coastal and lowland forests in the northern half of the North Island. Climbs by adhering to tree trunks and other rough surfaces with aerial, adventitious roots. When the juvenile plant eventually reaches the light, it gradually transforms into the shrubby, non-climbing, flowering, adult form. Cuttings from an adult plant will result in a small spreading shrub rather than a climber. Shaded parts of an adult shrub may produce juvenile climbing or creeping stems. Glossy, dark green, rounded leaves, 1-2 cm long on juvenile plants and 2-4 cm long on adult plants. Bright crimson flowers in dense clusters from mid winter to mid spring. Prefers a position in well-draining soil. If you intend to use Metrosideros carminea as a climber, then find a spot in the shade, preferably where it can grow towards the light. If you want to grow it as a shrub, then a sunny position is best. Suitable for coastal gardens. Once established, the crimson rata tolerates drought, and light to moderate frosts (USDA zones 8-11). The adult form copes well with exposed, windy conditions. Generally trouble free. Very tough, but slow growing plant. Spectacular when in flower. Worth the wait! Vigorous evergreen climber in the Bignoniaceae family. Native to parts of New South Wales and Queensland in Australia. Glossy, odd-pinnately compound leaves with 4 to 7 ovate to lanceolate leaflets. Flowering in summer with white to pale pink trumpet-shaped flowers with dark rosy pink throats, followed by long seed pods. Flowers best when planted in full sun and well-draining soil, but can also be grown in partial shade. Prune after flowering. Can be cut back hard. Once established, Pandorea jasminoides can cope quite well with extended dry periods. Tolerates light frost only when young. Pandorea jasminoides reliably puts on a fantastic show during summer. It will need support to climb, and you may want to keep an eye on it once it is established to make sure it doesn't grow out of proportions! Suitable for coastal gardens. Evergreen climber in the Bignoniaceae family with glossy, pinnately compound leaves and showy flowers in clusters during summer. Oval leaflets, 2-9 cm long, with entire to sparsely toothed margins. The trumpet-shaped, 6-8 cm long flowers are pink with darker pink to red stripes. Sometimes the flowers are followed by seed capsules that look like long, narrow green beans (to about 25 cm long and 0.5-1 cm wide). Origin uncertain: possibly indigenous to South Africa, but may have been introduced there by slave traders. Synonyms: Tecoma ricasoliana, Pandorea ricasoliana, Bignonia rosea. Prefers a position in full sun, but will handle partial shade. Grows in any rich, well-draining soil. Tolerates coastal conditions and wind. Mature plants can cope with moderate frosts (to about -7 0C). Once established, Podranea ricasoliana is reasonably drought tolerant. It does not produce tendrils, so needs to be tied to a support structure, and can be espaliered. Prune in winter or early spring. In parts of New Zealand this plant is regarded as a weed and a threat for the native vegetation. Vigorous climber with attractive foliage and a spectacular candy-floss pink flower display in late summer. Great choice where you want a fast cover for fences, walls, arches, or pergolas. Could be used as a ground cover, sprawling over rocks and banks. Grow in a large container in cold climates and move indoors during winter. Very vigorous, rambling rose with dark green, glossy foliage. Flowers profusely for about two months during the main flush starting in spring with apricot-yellow flowerbuds opening to creamy white flowers with a hint of yellow, fading to white. Some flowers throughout the rest of the season, possibly with a second, smaller flush. Mild apple fragrance. Registered as Rosa 'Albéric Barbier'. Bred by Barbier Frères & Compagnie in 1900 (France) from a cross between Rosa luciae (Rosa wichurana) and Rosa 'Shirley Hibberd'. Suitable for a sunny position in any well-draining soil with a generous amount of organice matter. Partial sun is best in areas with a hot climate. Shade tolerant. Fertilise in early spring and again in early summer. Prune after flowering. Suitable for coastal gardens. Good disease resistance. Make sure you have enough space for this one! Rosa 'Albéric Barbier' really goes for it, and is the perfect climber to cover fences, buildings, and arbors. 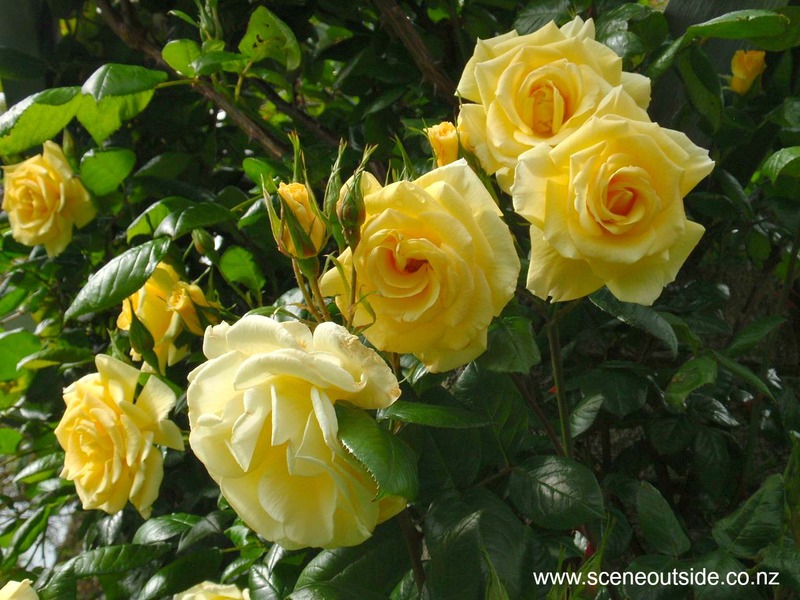 Repeat-flowering climbing rose with glossy dark green foliage and large, mildly fragrant, yellow flowers in clusters. Flowers are about 11 cm wide and have 26-40 petals. Vigorous, reliable and free-flowering. Registration name: Rosa 'HORanymoll', bred by Colin Horner (UK). Prefers a position in full sun. Happy in any well-draining soil with a generous amount of organic matter. Dead-head during the flowering season and prune in winter. Excellent disease resistance. Delightful rose, ideal for climbing against walls, fences, posts, pergolas and arches. Vigorous, repeat flowering hybrid musk rose with relatively few thorns, glossy dark green foliage and large, single to almost single flowers in clusters. Pale apricot-coloured buds open to 8-12 cm wide, creamy white flowers, fading to white, flushed with a faint hint of pink. The flowers have 4 to 8 petals and yellow stamens. They are usually packed in very tight clusters. Rosa 'Sally Holmes' is the result of a cross between Rosa 'Ivory Fashion' and Rosa 'Ballerina'. Bred by Robert Holmes (UK) and named after his wife. Prefers a sunny position in well-drained soil with a generous amount of organic matter. Tolerates more shade than most other roses. Very good disease resistance. Fertilise in early spring and again in early summer. Dead-head during the flowering season and prune in winter. Grows on its own root system and is easy to propagate from cuttings. The delicate colour combination of the pale apricot flower buds and white flowers is breath-taking and more than makes up for the fact that the flowers are only slightly fragrant. The flowers have a lovely 'loose' texture. Can be treated as a climber and trained to grow up a pillar or against a trellis. Suitable for cutting. Looks good on its own, in groups, or as a rose hedge-row. Vigorous, thorn-less (or nearly so), rambling rose with glossy, mid-green foliage. Once-flowering for about three to four weeks in spring with large clusters of relatively small purple-violet flowers with white stripes and blotches, a white center, and yellow stamens. The flower colour fades with age, in particular in hot, sunny conditions. The flowers are followed by small (0.5-1 cm long) brownish red hips. Bred in Germany by Hermann Kiese, and introduced in 1909 by Johann Christoph Schmidt. Also known as Rosa 'Bleu-Violet', R. 'Blue Rambler', R. 'Blue Rosalie', and R. 'Violet Blue'. Tolerates quite a bit of shade, heat, and poor soils. Prefers a position in well-draining soil where it is protected from the hot midday sun. Susceptible to mildew, so best grown in a position with sufficient air movement. Apply rose fertiliser in early spring. Prune in winter. A rose for the larger garden! The colour is particularly attractive in a partially shaded position. I could not detect any scent, but according to some sources Rosa 'Veilchenblau' has an attractive fragrance. 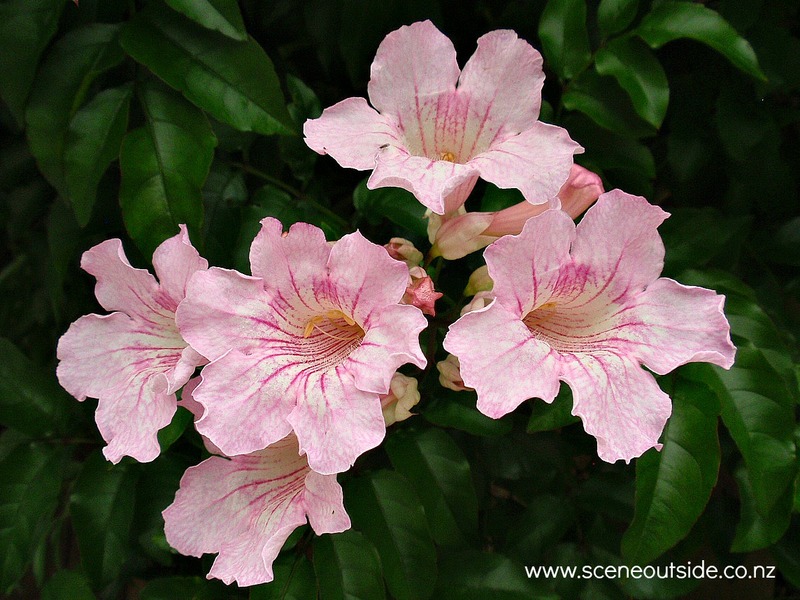 Vigorous, fast-growing climber native to Brazil. Flowers from late spring to late autumn with clusters of small star-shaped flowers. The latter are white with yellow stamens and resemble potato plant flowers, hence the name. May be pruned back hard, but that should not be required if pruned twice a year. The perfect plant to quickly cover a wall, fence, or trellis, and flowers for most of the year. Evergreen, self-twining climber, native to eastern and southeastern Asia. Oval to lanceolate, glossy dark green leaves, 4-10 cm long, 2-4 cm wide, arranged in pairs. Some of the leaves turn bronze or dark to bright red in winter. Flowering during late spring and summer with clusters of very fragrant, white, pinwheel-shaped flowers to 2 cm across. Plant in any well-drained soil. Flowers best in full sun, but copes well with partial or even deep shade.Tolerates relatively dry conditions once established. Suitable for exposed, coastal areas. Generally free from serious pests and diseases.Tolerates moderate frosts to about -120C. Versatile plant with intensely perfumed flowers that smother the plant from late spring. Climbs happily against support structures, and can be espaliered. Will not cling to masonry walls. Suitable as a ground cover, but may need regular pruning to maintain a tidy look. Also when growing Trachelospermum jasminoides as a climber, a yearly prune is recommended to keep the plant bushy. Also suitable as an indoor plant. Annual trailing plant, native to South America. Rounded to kidney-shaped, light to mid green leaves with wavy margins and long petioles attached to the middle of the leaf blades. Flowering throughout summer with bright yellow, red, orange, or bi-colored, 4-6 cm wide flowers, produced in the leaf axils. Flower corolla with three large and two smaller petals, and a 2-4 cm long spur at the base. The edible flowers, leaves and seeds have a peppery taste. Although Tropaeolum majus is not difficult to keep under control in garden situations, in the wild it has become invasive in several parts of the world. Prefers a position in partial shade or full sun with some afternoon shade. Flowering is best in soils with a low to moderate fertility. Very easy to grow from seed, planted after the last frost in spring. Spreads by self-seeding. Stems tend to trail along the ground, but when they reach other plants or a structure of some sort, they will happily climb upwards. Leaves are frost-sensitive. Nasturtium is a lovely, happy, and versatile plant to have in your garden, and very useful in the kitchen. Use the flowers to brighten up a salad, add them to a sandwich, or fill them with cream cheese, guacamole, or feta. You can do the same with the leaves; roll them up and tie the stem around the rolls. Nasturtium does well in containers or hanging baskets, and loves to climb with a bit of help. Great to plant in combination with winter-early spring flowering bulbs, hiding unsightly bulb leaves from spring onwards with lush green foliage and brilliant flower colours in summer.